CDTech is working in partnership with UCLA’s Center for Health Policy Research on the Smoke Free Apartments LA initiative. Funded by the Centers for Disease Control and Prevention, the SmokeFree Apartments For Everyone (SAFE) Project is a three-year campaign aimed at increasing access to smokefree apartments in low-income neighborhoods in the City of Los Angeles. CDTech’s team of community engagement specialists have spoken to more than 700 apartment tenants in South LA’s 8th and 9th Council Districts, with a majority indicating they would like to live in smoke-free multi-unit housing. 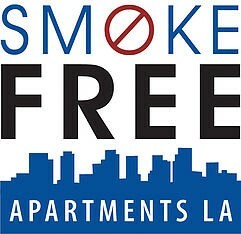 Even current smokers indicated a preference for smokefree apartments. As the City of Los Angeles and the U.S. Department of Housing and Urban Development implement smokefree public housing policies, the largest number of residents who rent in the open marketplace experience unequal protection. Residents have shared their personal experiences with us on how this has impacted their quality of life and affected their health (see community testimony below). A major component of this work is training grassroots leaders to provide ongoing education to the community about the health effects of second and third-hand smoke, especially among the most vulnerable populations – children, the elderly and those with heart and/or lung disease. These grassroots leaders are equipped to make presentations to a wide range of constituents and to refer smokers or those who have a smoker in their family to cessation support services. (see videos). CDTech is engaged with the Smoke Free Apartments LA initiative because it is at the center of why we help engage residents in the process of transforming and revitalizing their communities: to create healthy and vibrant neighborhoods where public spaces, families and small businesses can thrive. We believe there is a critical balance between Economics, Civic Engagement and Community Health.